Rotorsim, the joint venture owned equally by CAE (NYSE: CAE; TSX: CAE) and AgustaWestland, a Finmeccanica company, today announced that a joint team from ENAC (the Italian Civil Aviation Authority) and the European Aviation Safety Authority (EASA) has certified the world’s first AW189 full-flight simulator (FFS) to Level D, the highest qualification for flight simulators. The new CAE 3000 Series AW189 FFS is installed in the new simulation building at AgustaWestland’s A. Marchetti Training Academy in Sesto Calende, Italy. The Training Academy now has capacity for nine FFSs and five FTDs (Flight Training Devices), further expanding the AgustaWestland training capabilities in Italy as part of its global capability. The AW189 FFS was developed jointly by AgustaWestland and CAE, and will be operated by Rotorsim. The CAE 3000 Series helicopter mission simulator features unprecedented realism for helicopter-specific mission training, including offshore Oil and Gas Producer (OGP), Search and Rescue (SAR), law enforcement and other types of operations. The simulator enables pilots to practice -- without risk -- challenging procedures such as low-level flight, confined area operations, autorotation and landing on platforms at sea. The AW189 FFS being introduced by Rotorsim will support AgustaWestland in delivering operational training to its rapidly expanding number of AW189 operators. At present, the AW189 has been ordered in more than 130 units, including options and framework agreements. The CAE 3000 Series AW189 FFS features AgustaWestland flight dynamics and aircraft systems modelling, combined with the AgustaWestland avionics and sensors simulation software. The core CAE simulation technologies include: CAE True six Degree-of-Freedom (DOF) electric motion system and high-performance vibration platform to replicate vibration cues critical to helicopter pilots; a high-fidelity CAE Medallion-6000 image generator; and a direct projection 210 degree by 80 degree extreme field-of-view dome display system. The simulator handling and flight performances are modeled and tested using a comprehensive real helicopter flight data package and the combined experience of AgustaWestland and CAE pilots and engineers. Last February, two separate training agreements have laid the foundation for the global market of the AW189. Gulf Helicopters has placed an order with AgustaWestland for an AW189 EASA CS- FSTD(H) FFS Level C simulator to support the company’s pilot development training needs for its fleet of 15 AW189 helicopters. The simulator, growing the AW189 global training reach across the Middle Eastern region, is to be delivered in Offshore Oil and Gas configuration and is set to expand Gulf Helicopters’ training capability as an AgustaWestland Authorized Training Centre (ATC) and regional hub. Additionally, Rotorsim announced the purchase of a second AW189 full- flight simulator to be deployed to a training centre in Aberdeen, Scotland. 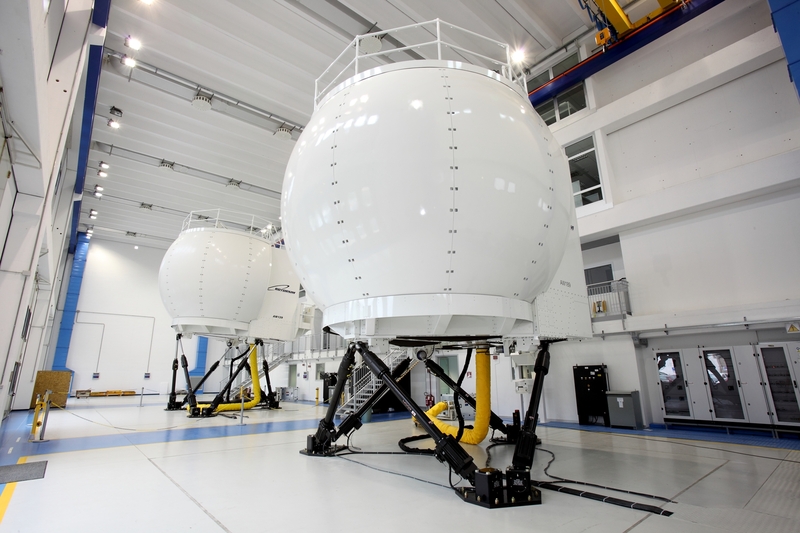 This CAE 3000 Series AW189 simulator, designed specifically to support training for SAR operations, will be ready-for- training in mid-2015 and will be used to support Bristow Helicopters and other North Sea operators. In September 2013, the first AW189 Flight Training Device (FTD) entered service, confirming AgustaWestland’s commitment to be ready for training prior to aircraft certification and to support the AW189 entry into service with a complete range of training services for pilots and maintainers. Training systems supplied by AgustaWestland are uniquely able to track the product configuration from the point of delivery through life, offering a complete and integrated operational environment, linking logistic and training management systems with flight and mission planning systems to share critical data in support of operational efficiency and effectiveness. Rotorsim was established in 2003 as a joint venture of AgustaWestland and CAE to provide classroom and synthetic training solutions for AgustaWestland helicopter operators. The Rotorsim training centre in Italy is located within the AgustaWestland ‘A. Marchetti’ Training Academy and now houses four CAE-built FFSs. Two of these simulators feature CAE’s revolutionary roll- on/roll-off cockpit design, enabling cockpits representing the AW139 and three variants of the AW109 to be used in the two simulators. Rotorsim also offers training on a CAE-built AW139 simulator located at CAE’s North East Training Centre near New York City. Rotorsim is also offering training in Sesto Calende, Italy, on the NH90 NATO Frigate Helicopter (NFH), and next year will add training for the AW169. enterprise solutions, in-service support and crew sourcing. The company applies simulation expertise and operational experience to help customers enhance safety, improve efficiency, maintain readiness and solve challenging problems. CAE is now leveraging its simulation capabilities in new markets such as healthcare and mining. More information can be found at www.cae.com. Follow us on Twitter @CAE_Inc and @CAE_Defence. A high-resolution photo is available in our photo gallery at www.cae.com/photos.